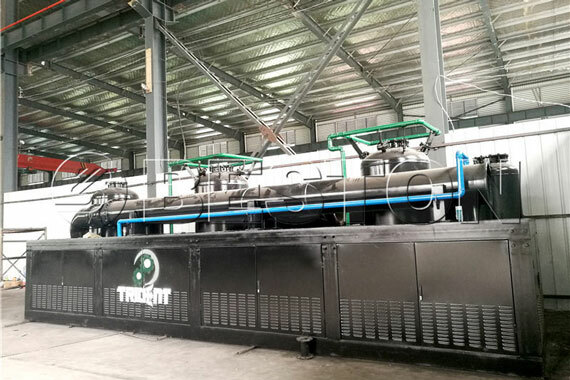 Waste tyre to oil plant produced by Beston mainly uses the principle of advanced pyrolysis technology, which can make it as an excellent way to deal with waste tyre, so it also can be called waste tyre pyrplysis plant. 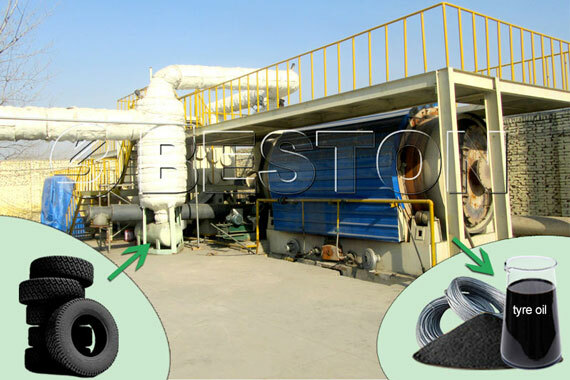 By waste tyre to oil plant, you can get about 50% tyre oil, 30% carbon black and 20% steel wire. All of them have high value, and you can not only create energy but also turn waste into wealth to make money. 1. Put the waste tires into reactor and rotate clockwise 0.4-0.8r/min. Seal the feeding inlet door tightly and make sure that there is no gas to leakage. 2. Heat the reactor by using coal, charcoal, fuel gas, wood etc. The reactor will be slowly heated, and when the temperature reaches about 250℃, the oil gas will be formed. 3. The oil gas will come out from the reactor and then go to condensing system to become liquid oil. 4. The gas which can’t be liquefied under the normal pressure will be conveyed to go back to combustion system through safety devices. It can be recycled to heat the reactor as fuel, which will save energy for the whole process of working. 5. After finishing the production of oil, the temperature of the reactor will be cooled down. When the temperature of reactor falls down to 40℃, the carbon black and fuel oil will be discharged by auto continuous operation pyrolysis plant. 1. Tyre oil: it is the first production by pyrolysis tyre to oil machine. You can purify it by Beston oil distillation plants to get non-standard diesel, which can be blended with gasoline based on a certain proportion to burn by vehicles. 2. Carbon black: it can be got and then sold directly at a certain price. You can reprocess it into high quality carbon or carbon brick. 3. Steel wire: it is also a main final product from tyre to oil plant. You can get it through Beston’s drawing machines and then sold directly to make money or it was made into steel bloom by hydraulic press-packing. 4. The combustible gas: it can be use as fuel. For example, you can use it to heat the reactor; you can also regard it as industrial and agricultural fuel. 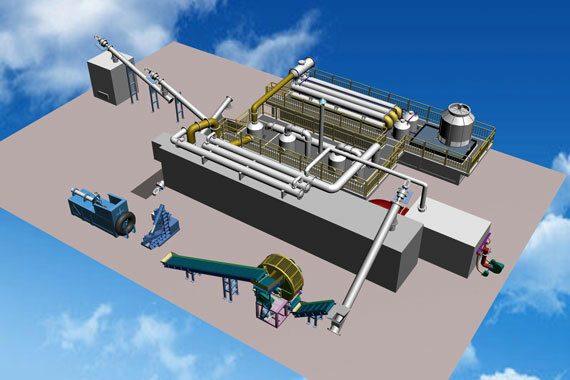 The continuous waste tyre to oil plant that we have invented can work 24 hours in a day; you can add chemical catalyst to speed up the reaction and increase the output; the combustible gas generated by the process of tyre to oil can be recycled for heating reactor continuously, which can improve the output, as well as save much fuel. In a short, it can realize small investment and achieve big gain. All of our tyre to oil plants are equipped with mature safety devices, such as thermometer, pressure gauge, safety valve and electric control system and so on. Once something dangerous happens, the workers will know immediately and can take response measures in time. It has used automatic submerged arc welding technology and ultrasonic non-destructive testing. All of the plants have passed the certifications of the CE, ISO and SGS. Moreover, all components use the materials of anti-corrosion. The most important is that the service life of our tyre to oil machines can reach 5-8 years. 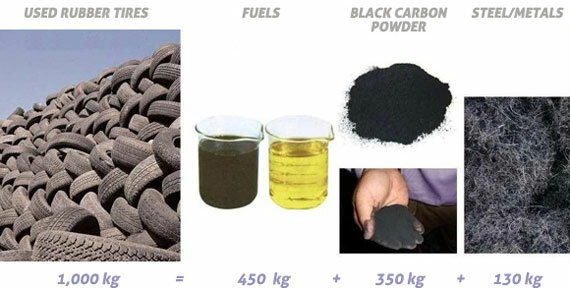 In the tyres to oil recycling process, there is also a little combustible gas produced. By the extra gas recycling system, the gas can be recycled to heat the reactor as fuel, which will save energy for the whole working process. Our tires to oil machine is equipped with advanced dedusting system(dust chemical removing tank, ceramic ring filtering system and alkali sprayers). In the system, three steps are used to dedust the hot smoke from reactor, more than 95% of the dust would be removed. The released gas is pollution-free and can be discharged in the air directly. In fact, the waste tyre to oil plant adopts the famous pyrolysis technology. Because it can convert waste plastic to oil, it is also called plastic to oil plant. Besides tyres, the pyrolysis machine can be also used for dealing with waste plastic, waste rubber, oil sludge and so on. It really realizes the fiction of a multi-purpose machine and create endless interest for you. As available resources are squandered by human beings, recycling resources has already been a serious problem. Tyre to oil recycling can provide a good example for recycling waste things. In recent years, the machine by recycling tires into oil have being popular among countries. Beston waste tyre to oil plants have been exported to more than 20 countries, such as Brazil, Dominica, Jordan, Korea, Turkey, Nigeria, etc. Meanwhile, we have established a good relationship with our customers and have won a good reputation all over the world. And even the governments take the lead in buying our waste tyre to oil plant, so what are you waiting for? Contact us now!